Flourless Sunbutter Cookies that are naturally gluten-free, dairy-free, nut-free, and soy-free making the best allergy friendly cookies. You are going to love how easy this Flourless Sunbutter Cookie recipe is. For more allergy friendly recipes check out my Gluten-Free Vegan Chocolate Ganache Cake. My Chocolate Lime Truffles are also quite scrumptious. This recipe post is sponsored by Enjoy Life Foods. Opinions, recipe, and photos are my own. 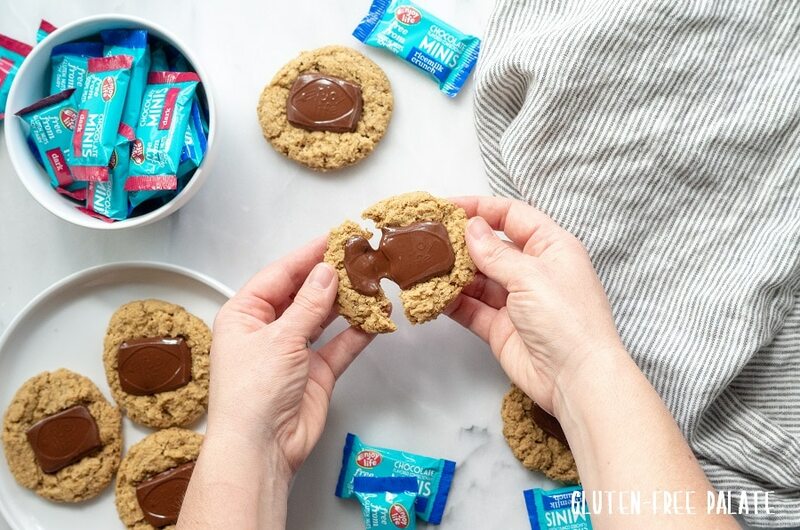 In this post I am sharing an easy flourless sunbutter cookie recipe and some of my favorite snack hacks that include chocolate. Because who doesn’t like chocolate? Especially when it’s Enjoy Life Foods chocolate. These are the best flourless sunbutter cookies and you are going to love how easy they pull together. Just imagine biting into a sweet cookie with ooey-gooey melted chocolate on top. Perfect! 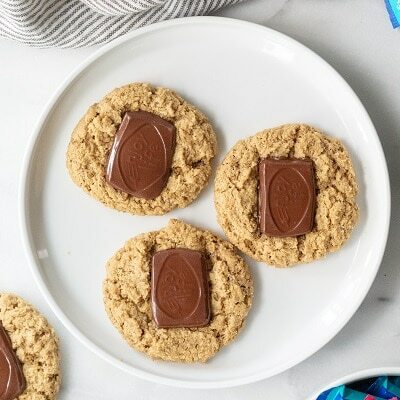 This flourless sunbutter cookie recipe is egg-free but I’ve put notes in the recipe card to swap the flaxegg for a chicken egg if you can do eggs. 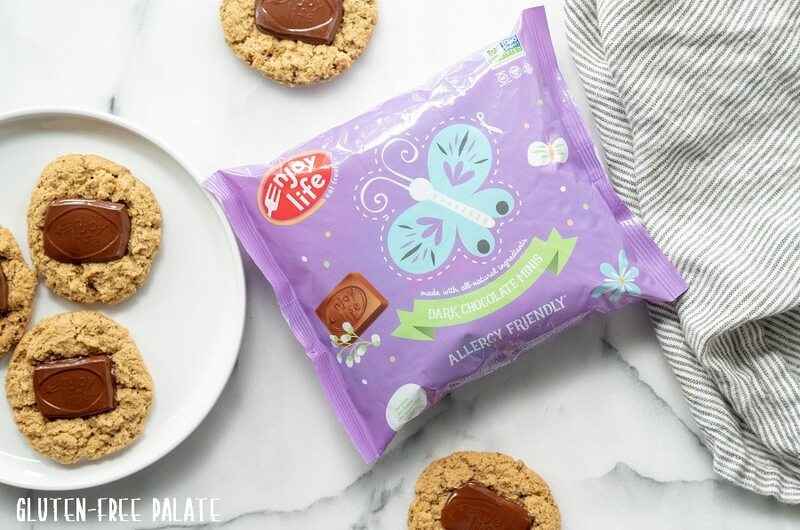 I am obsessed with the Easter Enjoy Life Foods Mini’s. They are free from the top allergens and they taste incredible. If you’ve read any of my other posts about Enjoy Life Foods products then you know we’ve been consumers for years. 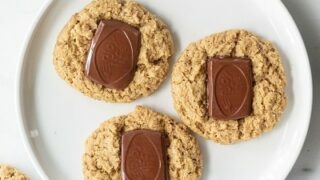 Top ANY COOKIE with chocolate – you can use the mini’s, mega chunks, morsels, or mini chips. Mix mega chunks or mini chips into granola and trail mixes for a sweet touch. Carry a couple of minis, or mini chip snack packs for a quick pick-me-up or to make an On-the-go Allergy Friendly Hot Chocolate. Dip a banana in melted chocolate morsels. Make a Black Forest Hot Chocolate (it’s actually pretty healthy). These are just a few snack hacks we use chocolate in. If you have a favorite that you don’t see on the list, let me know in the comments below. We are always looking for new ideas. Use high quality Sunbutter (or sunflower seed butter). Make sure you have your chocolate minis ready. Preheat your oven and mix your ingredients. Make sure you let the flaxegg sit for at least 10 minutes. Watch the time on the cookies so they don’t burn. As soon as they are out of the oven, press a chocolate mini on top. Let them cool before storing, but feel free to enjoy one while the chocolate is melted. What type of Sunbutter did you use? For this recipe I used the organic Sunbutter. It doesn’t have any added sugar or added salt, it’s organic, and creamy. Make sure to stir it really well before you add it to the recipe. If you use one of the other Sunbutter products with added salt or sugar, omit the salt and reduce the sugar to 3/4 cup. Can I use an egg in this flourless cookie recipe? 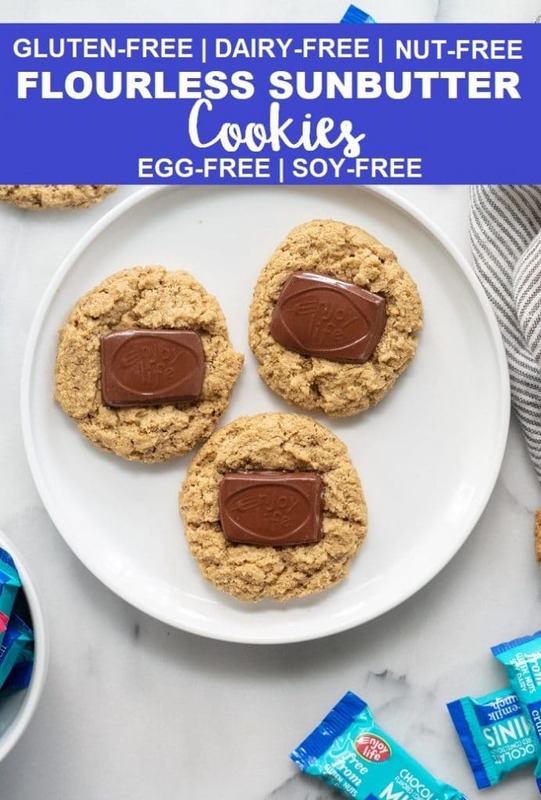 Yes, these cookies are free from the top allergens but some people can enjoy eggs in their diet. Replace the flax egg (ground flax seed + water) with one medium to large egg at room temperature. Just note that the cookies will be a little fluffier. Can I reduce the sugar in these flourless sunbutter cookies? Yes, you can reduce the sugar in these flourless sunbutter cookies from 1 cup to 3/4 cup. You can also use coconut sugar in this recipe. I hope you enjoy these flourless sunbutter cookies as much as we do. Make sure to check out my chocolate snack hacks for more yummy ideas. Did you make this recipe? Please leave a star review and comment below letting me know what you thought. Also, if you have any chocolate snack hacks to share I want to know about them! 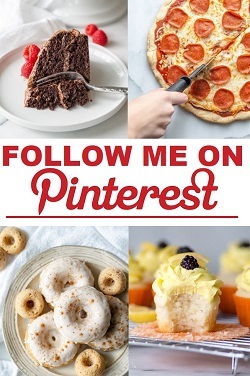 For more recipes and ideas follow me on Pinterest. Preheat oven to 350F. Line two baking sheets with parchment paper; set aside. For the flaxegg combine the ground flax seed and water in a small bowl and let it sit for 10-15 minutes. In a large mixing bowl, combine the sunbutter, sugar, vanilla, baking soda, and salt. Stir until combined. Add in the flaxegg and stir until combined. Bake for 15 minutes or until cookies are set and centers are cooked through. Cookies will spread. 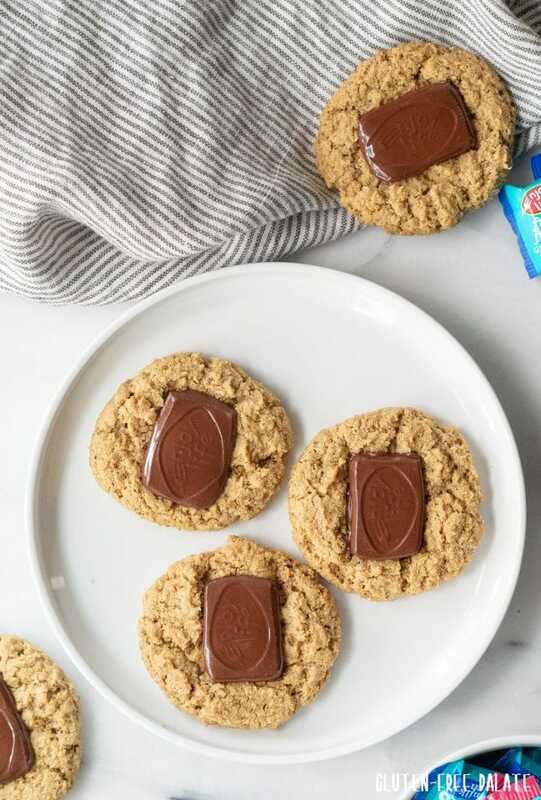 Remove from the oven and place one Enjoy Life Mini into the center of the cookie. Allow cookies (and chocolate) to cool completely before storing. Store in an airtight container for up to three days. Egg option: use one medium or large egg instead of the flaxegg in this recipe. Nut Butter Option: If you can't have Sunbutter you can use peanut butter or almond butter in this recipe. Please note it will not be nut free if you do. Sunbutter: Use organic sunbutter in this recipe. 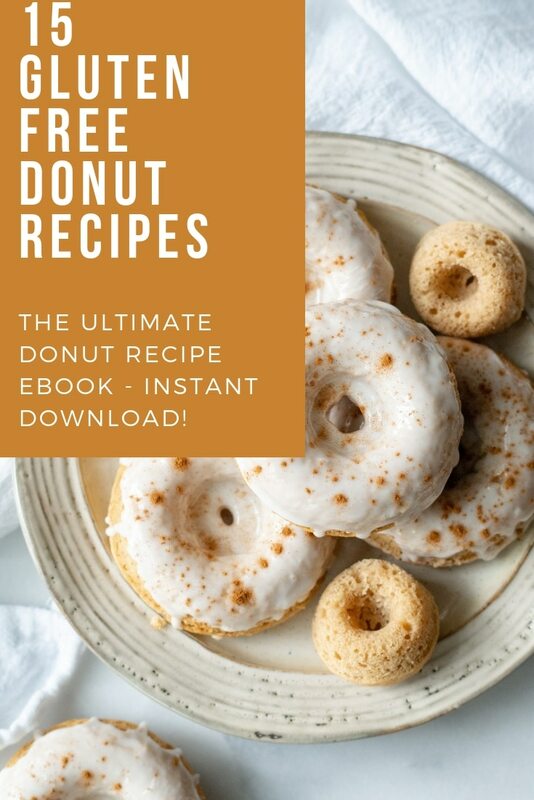 Reduced Sugar Option: You can reduce the sugar from 1 cup to 3/4 cup in this recipe. Refined Sugar Free Option: Use coconut sugar instead of granulated sugar, if you can have coconut. I agree! 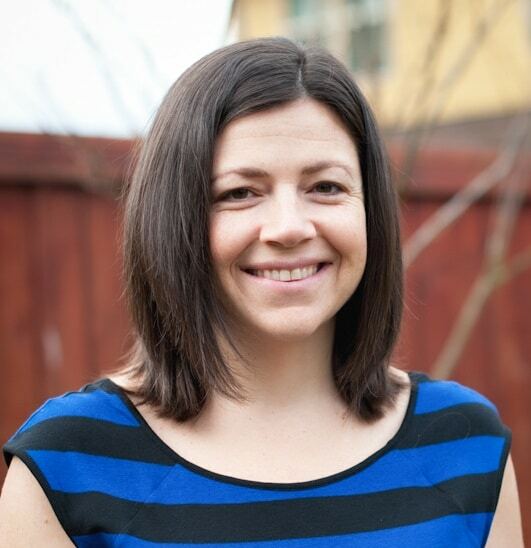 Thanks for stopping by Natalie!